The Havanese is a member of the Bichon family of dogs, which also includes the Bichon Frise, the Bichon Bolognese, Maltese, Coton De Tulear, Tsvetnaya Bolonka, Franzuskaya Bolonka and possibly the Löwchen breeds. These dogs were developed from the now extinct Mediterranean Bichon Tenerife, which was introduced to the Canary Islands by the Spanish and later to other islands and colonies of Spain by sailors. 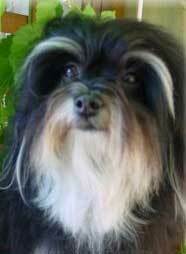 The Havanese itself developed uniquely in Cuba, either as the result of said Spanish sailors, or as is often believed by native Cubans, as gifts from Italian traders to open the doors of wealthy houses to their goods. The "Little Dog from Havana" even traveled back to Europe where it found brief favour in the late 19th century as a circus and trick dog and a court companion.